Today, Telerivet is excited to make it dramatically easier for anyone to create your own automated SMS system. Without needing to hire a programmer or write a single line of code, you can easily create your interactive messaging service just by building an intuitive, visual flowchart. 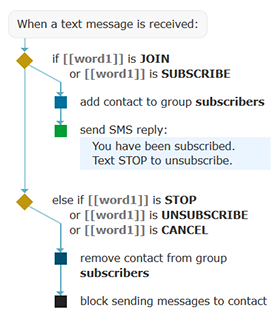 Each action in your SMS service has a corresponding shape in the flowchart, and the logic flow simply follows the lines and arrows between the shapes. It’s easy to add follow-up questions and handle responses to create an automated conversation. Creating this SMS system with Telerivet only takes 2 minutes from start to finish. In addition to triggering custom actions when an SMS is received, you can also trigger custom actions manually, for one or more messages or contacts. For example, you could message several contacts and wait for a response. Or, you could use custom actions to streamline your workflow and automate repetitive tasks like adding/removing contacts from groups, or updating contact information. There are dozens of other improvements with this update, all with the goal of making it even simpler to create and manage automated SMS services. To explore the latest updates, visit the Services page in your Telerivet account.